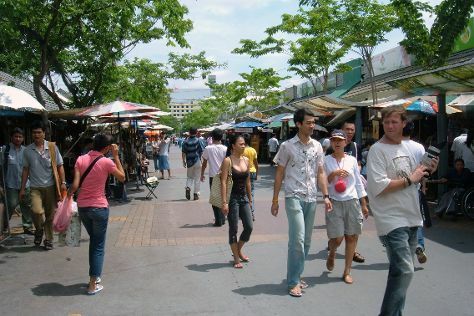 Give yourself a bit of retail therapy at Chatuchak Weekend Market and Rajawongse Clothier. Venture out of the city with trips to Damnoen Saduak Floating Market (in Damnoen Saduak) and Bang Saen Beach (in Chonburi). The adventure continues: soothe aching muscles at some of the top local wellness centers, explore the historical opulence of The Grand Palace, contemplate in the serene atmosphere at Temple of Dawn (Wat Arun), and take a stroll through Khao San Road. To find traveler tips, more things to do, ratings, and more tourist information, refer to the Bangkok custom trip planner. July in Bangkok sees daily highs of 39°C and lows of 30°C at night. Finish your sightseeing early on the 26th (Wed) so you can travel back home.